Goalkeeper Christian Walton says Wigan Athletic will travel down to Bristol City this weekend with plenty of confidence of pulling off their first ‘double’ of the campaign. Latics beat the Robins 1-0 at the DW Stadium back in September, to move up to third in the fledgling Championship table. Plenty of water has gone under the bridge since then of course, with Latics having slipped down to 20th place with seven matches to go. But after picking up four points from the last two matches – a win over Bolton and Saturday’s draw against Brentford – Walton says Latics are capable of pulling off a first away win in seven months, which would give themselves a real shot in the arm. “We beat them here at the DW – and that feels an awful long time ago now,” he told the Wigan Post. “But you can’t be looking back in this game, only forwards, and the challenges that lie ahead. “We can take heart from the defensive effort we put in against a good Brentford side on Saturday. “We showed great desire to keep them out, and that’s what we’re going to need over the next few weeks. It’s back-to-back away days ahead for Latics, who travel to another side in the play-off picture, Hull City, next Wednesday. 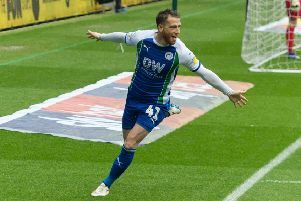 After that it’s the top two – Norwich City and Leeds United – in the space of five days, and Walton admits Latics would like to get the job done sooner rather than later. “We’re desperate to get the points we need as quickly as possible, and get safety secured,” he added.